This timely provision for the spiritual and temporal welfare of the colonists and natives of Western Australia has lately been erected at Busselton, in the Vasse District, about 130 miles south of Perth, the seat of Government. It affords a considerable frontage to Geography Bay, and is also well watered by the River Vasse. For some years, the project of erecting a Church in this neighbourhood had been agitated, and many of the settlers, as well as their friends in England, exerted themselves to bring about so desirable an object; amongst them, none were more active than the Bussell family, from whom the townsite takes its name. In the latter part of the year 1843, funds considered sufficient for erecting the walls and covering-in of the same having been received from England in addition to the local subscriptions, it was resolved to proceed thus far, trusting to future exertions for completion. 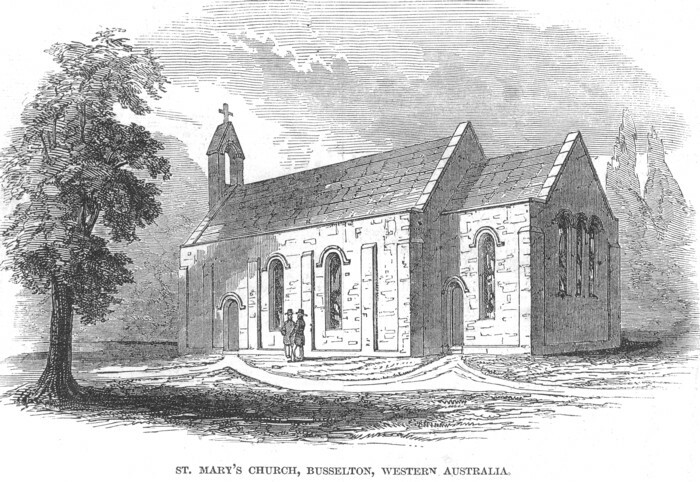 Plans and estimates were, accordingly, prepared by Mr. F. Brabazon Forsayth; the foundation-stone laid on the 4th of March of the following year; and the Church was opened in April, 1845, by the much respected Chaplain of the District, the Rev. J. R. Wollaston, attended by a large assemblage of the inhabitants for a circuit of many miles. The building, of which the annexed is a correct representation, from a drawing made upon the spot, is a plain but substantial stone edifice, with circular headed windows and doorways; between the former and at the cornices are buttresses reaching to the line of springing. The Nave or body of the Church is forty feet long, and twenty feet wide; the Chancel fourteen feet long by twelve feet wide ; the walls are sixteen feet to the line of roof; the exterior presenting a height of eighteen feet from the ground to the parapets, which extend all round. The roof, which is of native mahogany, is constructed with principals, purlines, &c.; they are very massive, and, having been well oiled, they have a very handsome appearance. The whole roof, externally, is close-boarded and shingled. The Chancel, which is raised two steps from the Nave, is lit by a window on each side, in addition to the three-light window over the altar. A bell-gable rises about 10 feet above the west-end, the dead wall of which is somewhat relieved by a circular window. The congregation are, however, in hopes of being enabled to affix a characteristic tower, which the architect's original plan embraced. The interior fittings at the present time are necessarily of the simplest description, no funds being available for the purpose. Suitable open pews on each side of a centre aisle are intended to afford accommodation for about 140 persons. The total amount of money expended has been £300; and, considering the scantiness of funds, as also the difficulty of procuring workmen, the whole has given very general satisfaction.